David Deron Haye – born in Bermondsey, London, England, on 13th October, 1980, to an English mother and a Jamaican father – is one of the finest British boxers of the 21st century so far. A talented amateur, Haye won a silver medal at the world championships in 2001, before turning professional in 2002. His victory over Jean Marc Mormeck in France in 2007, is one of the rare occasions a Briton has won a Ring Magazine title on foreign soil. Unfortunately, on the most famous night of his career, David gave a lacklustre display, losing a lopsided points decision to Wladimir Klitschko. Disappointingly, a high percentage of the media and sports fans seem to judge his boxing career via this one contest. Wladimir, however, was one of the most dominant heavyweights of all-time and was at his zenith in Hamburg at the time of this clash. It is worth remembering that Haye was also giving up three inches in height and reach, and tipped the scales thirty five pounds lighter than Dr Steelhammer. In the past 100 years just one British boxer has managed to defeat the world’s highest rated boxer in two separate weight divisions: Joe Calzaghe. David Haye – the former cruiserweight king – has the potential to join Joe in the history books but to do that he must claw his way back into the heavyweight mix, and then topple the consensus number one – currently that man is Tyson Fury. Irrespective of how he performs in his “comeback” though, as time passes, hopefully his already outstanding career, will be assessed with a greater degree of objectivity. Here we look back at some of his greatest performances. David blew the European cruiserweight champion away in a paltry 45 seconds – a perfectly timed, savage, straight right cross was all that was needed. In 2004 Haye’s inexperience, and over eagerness to render veteran Carl Thompson unconscious, backfired. The wily, unbreakable Thompson, stopped an exhausted Haye in the 5th round. Two years later, when faced with the relentless Giaccobe Fragomeni, Haye displayed an ability to box both efficiently and intelligently. Despite a laceration above his left eye which had been leaking blood from the 7th round onwards, Haye retained the precision and punch power necessary to stop his rugged, durable opponent after nine competitively fought rounds. The Italian went on to win the WBC cruiserweight title in 2008. Any question marks regarding Haye’s tenacity and thirst for battle were answered in this fight. Mormeck – who had lost just once in the previous ten years – was the reigning Ring cruiserweight champion, and was fighting in his home country of France. After an evenly matched opening, Haye’s slick boxing almost became inconsequential, as Jean clubbed him to his knees midway through round 4. The Englishman was shaken but survived the round. In the 7th round, Haye fired a variety of punishing power shots, which culminated in the ripping right uppercut, left hook, and right handed “hayemaker” which ended the bout. The WBA/WBO/WBC and Ring Magazine unification fight between two of the world’s best and hardest punching cruiserweights didn’t last long. Haye’s superior reflexes and hand-speed were evident. Enzo absorbed two solid right crosses in the 2nd round, but the third buckled his knees, slumping him against the ring post, and inviting Haye to pummel the Welshman to defeat. Between 2005-10 Nikolay Valuev was a constant figure in the Ring Magazine heavyweight top ten. His often underrated boxing ability and gigantic physique made him a problematic opponent for everyone who stepped in the ring with him. Haye managed to out-speed and outsmart Valuev, winning the WBA title on points. In the 12th round the former cruiserweight even managed to stagger his 7 foot tall, 316 pound adversary. The fact Haye accomplished this feat in Germany, made the victory all the more impressive. During the two years prior to their July 2012 grudge match, the former British/Commonwealth champion – Dereck Chisora, had lost closely fought tussles with Tyson Fury and Robert Helenius, and given Vitali Klitschko a stiff challenge over twelve rounds for the WBC title. Haye and Chisora set a high intensity from the opening bell. David used effective ring movement to evade many of Chisora’s charges, while countering with sharp, snappy punches of his own. Dereck had some successes, most notably the swinging left hook he clipped David with at the end of the 3rd round. However, by the 5th, Haye had unlocked Chisora’s defence, flooring him with a pinpoint, booming right cross. “Del boy” gamely rose from the canvas, but Haye swiftly attacked, connecting with another powerful right hand in the final seconds of the round, stopping Chisora for the first time in his career. 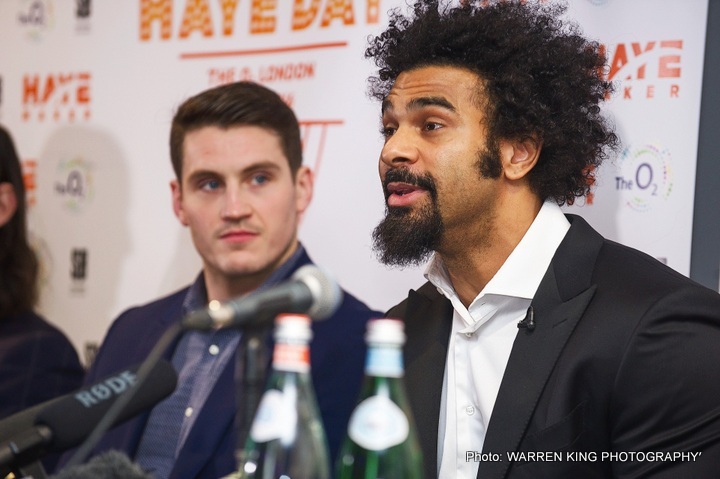 David Haye v Mark De Mori – 16th January 2016 at London’s O2 Arena. Live on free-to-air channel Dave. Coverage begins at 9pm in the UK.